By voting on the books listed, you can help to determine whether a book is related to the theme of Diet Passions, or whether it is a non-related, but popular, book among the members of the site. If you believe a book in the list below is 'on theme' with Diet Passions, vote that it is relevant. (If you don't know, just skip it.) 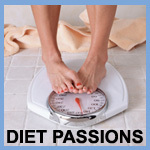 Over time, we hope to have a library of books that should be of interest to Diet Passions members. The 17 Day Diet is a simple plan that gets big, long-lasting results if you stick with it and let Dr. Mike help you along the way. Whether this is your first attempt at dieting or your fiftieth, you must believe that you can do this. This is one of the best-selling books on juice-fasting on the market. Practical Paleo explains why avoiding both processed foods and foods marketed as "healthy"—like grains, legumes, and pasteurized dairy—will improve how you look and feel and lead to lasting weight loss. Incorporates anthropological knowledge of the paleolithic human diet into a nutrition, exercise, and lifestyle regimen to help lose weight while avoiding cancer, diabetes, Alzheimer's, and other diseases. This is not a restrictive diet or another page in the high-protein vs. vegetarian diet wars, but a universal map to better health, one that Tana has distilled into a lean six-week program.